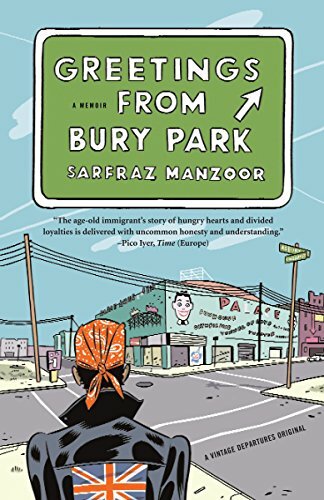 Greetings from Bury Park Both a tribute to Bruce Springsteen and a story of personal discovery, "Greetings from Bury Park" is an exceptionally perceptive and timely memoir about how music transcends religion and race. In the summer of 1995 I was twenty-three years old; an unemployed British Pakistani with shoulder-length dread-locks, a silver nose ring and a strange fascination with Bruce Springsteen. It had been six years since I had last lived with my family; having left to study in Manchester there had never been a reason to return to my hometown, Luton. After graduating in economics I had assumed I would be deluged with lucrative offers of employment but these had failed to materialise. While my friends were beginning careers in accountancy and medicine I was most successful at being fired from low-paid temporary jobs: I had been sacked from a data-inputting job for only typing with one hand and doodling with the other, and fired from a credit control agency for having stuck an obscene Public Enemy lyric scribbled on a Post-it to my computer screen. The longest job I had was as a directory enquiries operator. Being a slacker had never been a specific career goal but it was a lifestyle to which I seemed suspiciously suited. My parents had assumed that once I graduated I would return to Luton with a degree and a job, but despite my lack of career and cash I was still not willing to come home. In Manchester I was free; I could stay out late, play music as loud as I wished, wear black leather trousers and red velvet shirts and shake my dreadlocks to Lenny Kravitz. Once a month I would make the three-and-a-half-hour train journey back to Luton to see the family but only out of a sense of obligation. I was barely on speaking terms with my father and most of my conversations with my mother were about how I hardly talked to my father. When I walked through the front door of my parents' home in my blue corduroy jacket with a `Born to Run' enamel badge pinned on its lapel and my rucksack on my back, my headphones still plugged in my ears, I could sense my father's confusion. I knew he was thinking, `What are you doing with yourself?' and the worst part about it was that I could never explain it to him. When I rang my father to tell him I had secured my first writing commission he was silent for a few seconds. `How much will they pay you?' he finally asked in Urdu. I never spoke in English to my parents. `What are you going to be writing?' he asked. `It's an interview with an American writer called Elizabeth Wurtzel,' I answered. I boarded the Intercity train from Manchester Piccadilly to London Euston on the morning of 16 May 1995. Once in my seat I opened my copy of the Guardian, which had a story on the former Pakistani cricketer Imran Khan and his engagement to twenty-one-year-old Jemima Goldsmith. From my jacket pocket I pulled out a CD player and placed the headphones around my head. Bruce Springsteen's Greatest Hits had been released only weeks earlier and was in my CD player. As the train rolled slowly out of Piccadilly station I pressed the play button and began planning for the interview. The interview was scheduled for two o'clock but, having left the directions to the hotel back in Manchester and being unfamiliar with the London underground, it wasn't until almost twenty past two that I was finally introduced, sweating and sticky, to Elizabeth Wurtzel. She was petite; with her enormous eyes and fragile body she looked the dictionary definition of kooky. Elizabeth very graciously accepted my fulsome apologies but each time she looked at me, my dreadlocks tied in a pink bobble and a ring in my nose, I had the feeling she suspected I was not a real journalist. I had scribbled my questions in haste on a sheet of paper and the dictaphone I was using had only been bought that morning. Wurtzel sat cross-legged on the floor opposite me sipping herbal tea while I placed the dictaphone next to her. Once we started talking my nerves disappeared. Mortified, I picked up the machine and examined the tiny cassette. `Yeah, you're right,' I said, trying desperately to appear unfazed. It was at times such as this that I felt blessed to be brown-skinned; at least I did not have to be worried about blushing. `It's not a problem, I'm making notes of what we're saying,' I lied, staring with rising panic at the blank sheet of paper on my lap. I handed the offending machine to her and looked on helplessly as she examined it and, with the simple act of changing the direction of one of the batteries, made it work. My shame was now complete: I had been left looking like a fool in front of the woman whom I was interviewing, and whom I secretly fancied and hoped to seduce with my charm. To her eternal credit, Wurtzel remained helpful and charming despite the unpromising start to our interview; she reminded me of the questions I had asked and even extended our conversation to accommodate the earlier difficulties. This confirmed my long-held theory that anyone who likes Bruce Springsteen is by definition a nice person. After the interview I took the Thameslink train back to Luton. As the train trundled closer to its destination I began the familiar process of mentally acclimatising to coming back home. Luton gave me a headache. `And this course, how much does it cost?' he asked me, removing his glasses. The next morning I said goodbye to my mother and my father drove me to the train station in our old silver Ford Cortina. I got out of the car, thanked him for the ride and waved him goodbye. As I boarded the train back to Manchester I sighed with relief. I was returning to my life and he was returning to his. I defined myself in opposition to my father. All that he believed, the values he upheld, the ambitions he cherished I rejected as embarrassing and outdated. When he said he was Pakistani, I declared I was British; he was Muslim, I was confused; he believed in family, I championed the individual; he worshipped money, I claimed it meant nothing. I convinced myself that we were so different, the notion that I might have inherited anything from him appalled me. The sooner I could shed my past the better. When I was younger I didn't want to know who my father was because I believed my father had nothing to do with me. How wrong can a son be? My father had an official birthdate but I do not know when he was born. Officially Mohammed Manzoor was born on 1 April 1933. The month of his birth was almost certainly incorrect but the actual year was also possibly wrong. The lives of villagers living in rural India in the thirties were not considered important enough to be recorded with much detail or accuracy. Mohammed's father was a soldier who would later spend three years fighting for the British in Japan during the Second World War. My great-grandfather had also been in the army and died suddenly in his early sixties from a heart attack. My mother, Rasool Bibi, was distantly related to my father. She lived in Paharang, a village near what is now Faisalabad, while my father was from the village of Tuttha Musa, near Gujrat. My mother's father owned a store which sold fruit and vegetables. His father and grandfather were both in the army. Her official birthday is 1 August 1933 but again, she does not know the true month or year that she was born. She was the youngest of five sisters and one brother. When my mother was fourteen her father passed away, a year later her brother's wife and her twenty-two-year-old sister died within months of each other. Without a father, responsible for both her elderly mother and the seven-year-old daughter of her brother, Rasool Bibi would earn money for food by helping her neighbours with their cooking and cleaning. On their wedding day my mother wore borrowed jewellery: the gold necklace, the nose ring that was attached to her earrings, the bangles, everything was lent by the women in the village. Years later, whenever my father made any money he would go to Babulal Pattnis, the goldsmith on Dunstable Road in Bury Park, to buy my mother gold bangles and rings. When my mother would protest that she was too old to be wearing such extravagant jewellery, my father replied that he was trying to compensate for the shame of having to accept borrowed gold on their wedding day. Two days after they were married my father returned to Karachi where he was working and my mother remained in Paharang to look after her elderly mother. She did not join my father for another eighteen months. Mohammed worked as a senior clerk in the Karachi Development Authority and it was his responsibility to allocate plots of land to incoming migrants from India. His brother worked for Pakistan International Airways and through him Mohammed learned about how many Pakistanis were heading for Britain. Britain had been encouraging Commonwealth immigration from India and Pakistan but by the end of 1962 free entry into Britain would be replaced by immigration controls, and employment vouchers would be needed to be allowed to work in Britain. Mohammed was ambitious and did not want his children - as yet unborn - to have to endure the hardships he had experienced. My father first revealed to my heavily pregnant mother that he was considering leaving for Britain in early 1962; he told her it would be for five years, enough time to earn and save money and return to Pakistan. It would be twelve months before he was finally able to secure the visa which would allow him to leave Pakistan. He left for England in January 1963. My older sister Navela was just one year old and my brother Sohail had been born barely a month before. How could my father have left his young family? He told his wife he must go to England before the children could speak; once they could tell him how much they would miss him, it would be too heartbreaking to leave. My mother claims she did not try to change her husband's mind because for a full year before he left he had kept reminding her that the only way their children were not going to be condemned to poverty was if she allowed him this one chance to carve out a better future elsewhere. And so, keeping any fears and reservations she might have harboured to herself, my mother gave my father her blessing. Mohammed Manzoor arrived in England in the second week of January 1963. Britain was in the midst of its coldest winter for two hundred and fifty years; whenever he talked about coming to England it was always the bitter cold my father most vividly recalled. It was so cold that in the week my father landed in Britain the Central Electricity Generating Board was urging people to avoid ironing their clothes to reduce the risk of rationing. Britain was still three months from the release of the first Beatles album, Cliff Richard was number one with `Bachelor Boy', Harold Macmillan was Prime Minister and Laurence Olivier was performing on the London stage. Many years later I would sometimes ask my father for his memories of the swinging sixties; I hoped to hear that he might have seen the Beatles or the Stones or perhaps wandered through Carnaby Street or down the King's Road.